So yeah, Maarten started a pitboss and I have (literally) nothing else going on for a few months. Here's my uneducated opinion on what I'm doing wrong, and sort of a logbook to keep my ideas straight. Plus, you know, screenshots. I heard those give points. By the time I got in, there remained only the Americans, French, Babylonians and Persians. And thus, the République du Québec establishes EGGnSPAM on the western coast, with designs upon THE WORLD. Last edited by Beorn; 17-02-2019 at 21:12. 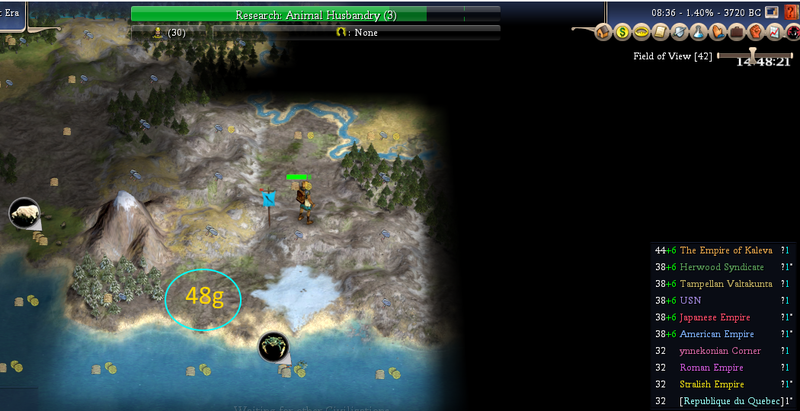 Find horses, grab them, expand to the best early city locations and conquer the rest. Last edited by Beorn; 23-02-2019 at 04:18. The romans have played but haven't increased score. Possible move-settle. 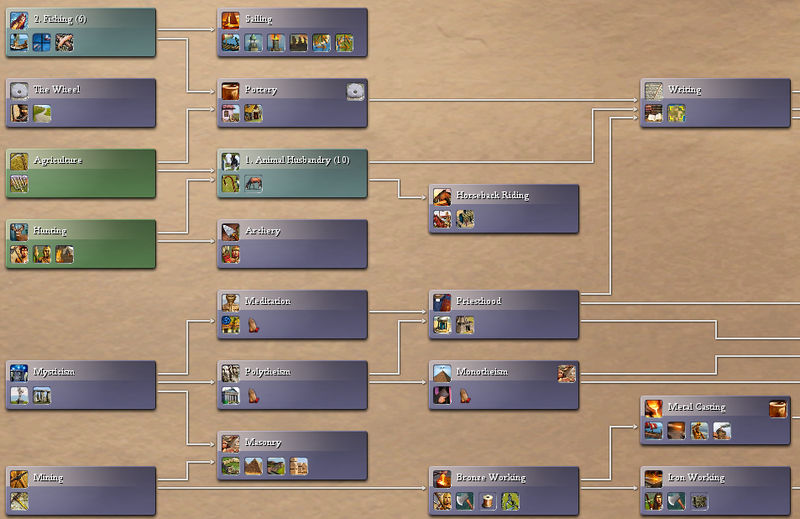 IDK if starting locations were pre-balanced - if not I may have a sizeable advantage with my starting 21. Since I start with hunting, Scouts will be deployed. 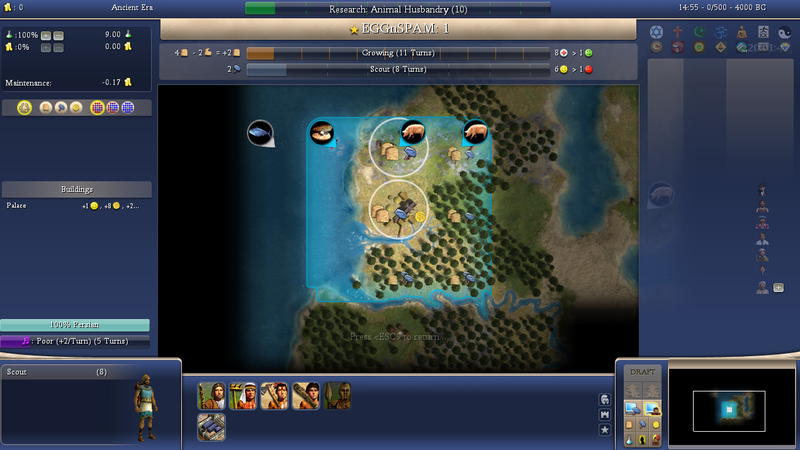 With over 8 players, 1 or 2 should do before workers and workboats. 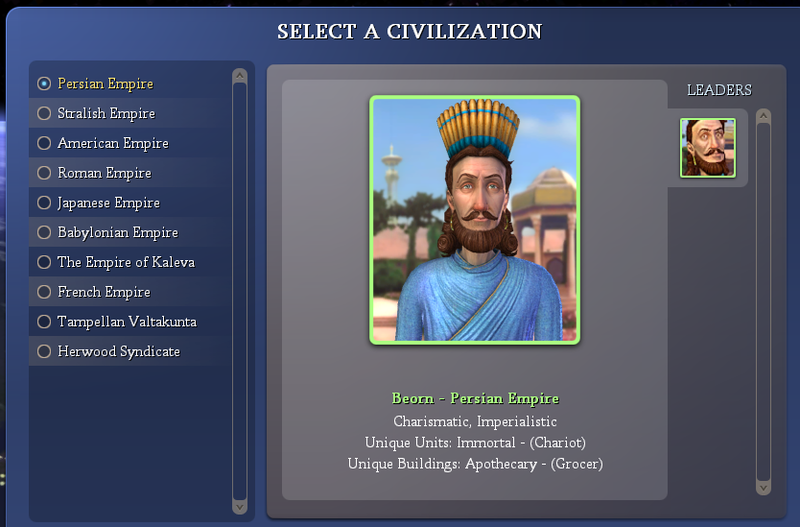 wait, wasn't it worker first in CIV? Anyways, need techs before worker so scout first. Double scratch that, worker (15) will spawn after tech (10) is done AND those pigs are +3 food. It'll be a lonely 2 weeks for that scout. Hope he pops a nice goody hut. Last edited by Beorn; 17-02-2019 at 21:33. Goody hut with medium gold. Beats a slap in the face. Also, more forests and plain hills. 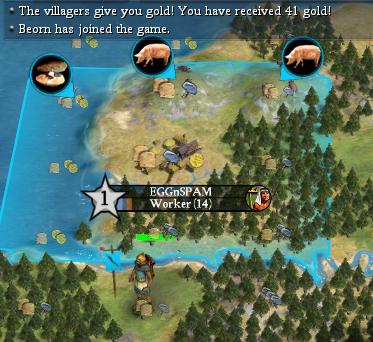 Gonna be hard on commerce though I may be able to go GP economy with the pigs. More scouting needs to be done before that. The capital does, nonetheless, have TONS of whip and chop potential for early wonders. Or an early stack of doom. We'll know what the map decides for us in the first week or two. 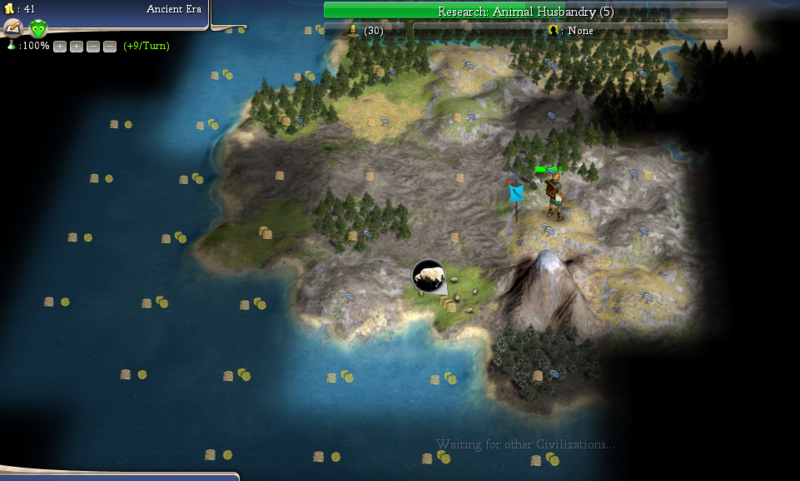 CIV was circle-scouting not straight-line scouting right? Guess I mostly need to know where to settle anyways. Since I'm not making units, circles will have to do. Last edited by Beorn; 18-02-2019 at 15:03. Tons of chops, foor for whip, fresh water, stone and pigs for city 2. Stone for Stonehenge which gives a free monument everywhere, I get free happy from monuments. Man, the CFC war academy is great. Behold! the glory of the SW lands. This area shall be dubbed: Buttfuck Nowhere Peninsula. Population: 0. Not even wildlife. Another goody hut, another medium gold. Also, something interesting today: score increases. I guess that means most of them got a warrior at the same time, or growth at the same time. Also, that the mongols are ahead from goody-hutting a unit. Let's hope a worker will pay off before long. I'm confident that it will, with 2 pigs. There are sheep, so it's not only buttfuck country. Got AH: no horses either. Anywhere within what I've uncovered of a first ring anyways. Those sheep better put out. - the ever so religiously devout Matrix is now the proud owner of a christian holy city. Last edited by Beorn; 27-02-2019 at 02:42.